Kelda and I are SO excited to bring to you our ultimate guide to Paris - specifically for beginners. We have been to Paris three times and, each time, it leaves us wanting more and feeling that there is so much more to explore. It is truly the city that made us fall in love with traveling and we hope that everyone will be able to experience its magic - and put some of our tips to use! St Germain - 6th - St. Germain is quintessential Paris. Glamour, luxury, upscale. Many of history’s most renowned writers, including Hemingway and Voltaire, wrote their classic novels in cafes in this area. Le Marais - 3rd and 4th - Le Marais is trendy, chic, packed with must-try bars and restaurants and is the LGBT capital of Paris. It is a shopaholic’s dream with countless boutiques that you could spend all day getting lost in - primarily just window shopping though. Montmartre - 18th - Montmartre is home to some of the best views in Paris, specifically from its Sacre Couer Basilica. While a bit of a trek from the city center, it is a must visit for anyone wanting to experience the true culture of Paris. Montmartre is also home to Moulin Rouge, Pigalle and Paris’ Red Light District. *Notes on where not to stay : 7th and 8th arrondissements - home to the Eiffel Tower and Champs Elysees. When booking our first trip to Paris a few years ago, we assumed that anywhere near the Eiffel Tower was “the place to be.” The Eiffel Tower isn't as close as you might think from the city center and isn’t a super convenient place to stay if you want to experience the rest of what the city has to offer. If you're planning to stay in an Airbnb while in Paris first time users can use this code for $40 off! Even if you aren't typically a museum lover - we certainly aren't - the museums in Paris are some of the most renowned in the world and are worth a visit. Outside of the art, these museums are architecturally stunning on their own and some of the most beautiful buildings we have ever seen. To give you any indication of the beauty, the Louvre was formerly a royal palace and is so large that it would take SEVENTY FIVE days to be able to explore the whole museum. Notre Dame is actually located on an island in the Seine River, in the 4th arrondissement, close to the heart of Paris. The cathedral is almost 1000 years old and absolutely breathtaking. 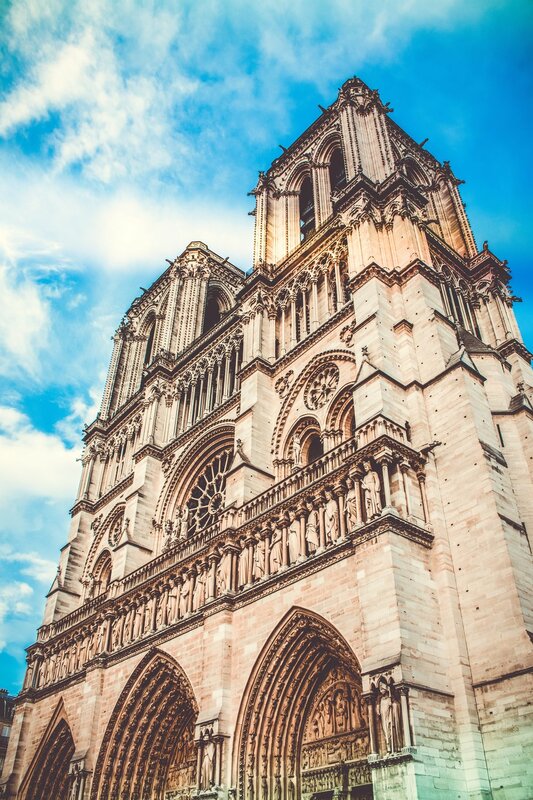 For one of the best views of Paris, we would highly recommend climbing the bell tower. But arrive early! Almost 50,000 people visit the cathedral every day. If you start your day here, you will be walking distance, or a short subway ride, from many of the other most famous tourist destinations. Sacre Couer is located in the Montmartre neighborhood, a bit outside of the city center, but offers some of the city’s most stunning views. After visiting the basilica, which is well worth the steep uphill climb, we would highly recommend enjoying a picnic and a bottle of wine while taking in the views from the top of the hill. Our best advice here is to plan early. It should come as no surprise that the Eiffel Tower is one of the most visited attractions in the world and tickets sell out weeks in advance. As soon as you have your trip booked, we would recommend purchasing your Eiffel Tower tickets. There are a few options depending on how far up the tower you would like to go. We would recommend going all the way to the top, but stop at the champagne bar halfway up for a drink and a macaron. Every night, on the hour, the tower lights up for five minutes and is one of the most beautiful sights you will ever witness. Place de Trocadero is our favorite spot to take in the light show. Located at the end of the Champs-Elysees, the climb provided a great workout to burn off our many glasses of wine and Croque Madames, as well as another stunning view of the city. Another site that does get super busy, so expect to wait in line. If you are short on time and can only wait in one line, we would actually recommend the Arc De Triomphe over the Eiffel Tower. One of the most famous and luxurious department stores in the world, Galleries Lafayette actually takes up a few city blocks with separate stores for Women’s Clothing, Men’s Clothing and a food and wine hall. Not only can you browse some of the finest merchandise and brands on the planet, but the architecture is absolutely stunning. At the top of Galleries Lafayette is a rooftop lounge - called the Ice Cube - that offers a panoramic view of the city and one of the only views that is both free and doesn’t require hours of waiting in line. A river cruise is a must when visiting Paris and was one of our favorite experiences. On one summer trip to Paris, we were able to experience the banks of the river packed on both sides with so many people singing, playing music, picnic-ing, drinking, the joie de vivre of Paris. The cruises are super affordable - about $10 each - and run many times a day. Many companies offer cruises and we have taken two through Vedettes du Pont Neuf. Plus side - the dock is located right next to the famous Love Locks, so you can squeeze in another site in the same trip. One of our favorite travel experiences of our entire lives. This show was AMAZING and is worth every penny of the higher price point - apprx. $120 depending on which show time and ticket type you select. For any fans of the movie, just visiting the outside of the theater and taking in the iconic red windmill is a must, but you will not regret choosing to block out an evening to take in the show. Complete food and drink guide to come, but below are a few of our favorites! Les Deux Magots & Cafe De Flores - Probably the most famous cafes in all of Paris, located in the super chic St. Germain neighborhood. These cafes are right next door to one another so you can take in both with one visit. Best known as the hub for the literary and intellectual elite back in the day - including Hemingway, Picasso and Sarte. La Maison Rose - Iconic pink restaurant that you have likely seen all over Instagram. Absolutely charming restaurant with quality food and drinks at a great price. Very intimate location and only about 5 tables in the whole restaurant, so be sure to call ahead. Cafe du Trocadero - Most stunning view of the Eiffel Tower in all of Paris and is amazing at any time of the day, but would most recommend visiting for an after dinner drink for a front row seat to the tower's evening light show. L'Avant Comptoir - Great place to grab a pre-dinner drink and apps. Standing room only, finger food and hors d'ouevres. Angelina's - Known worldwide for its hot chocolate, Angelina's is a tea house that offers a full menu, but specializes in desserts and tea. Just putting together this post made us both eager to plan our next return. We still haven't scratched the surface of all that Paris has to offer and are excited to share more about one of our favorite cities in posts to come.